How do you understand the natural history of rocks and water on another planet when all you have are pictures? You do the math. Scientists have discovered how to use images of pebble shapes to estimate to estimate how far water may have moved them in ancient Martian riverbeds. These estimates enhance geographic information about the planet to provide even more evidence that Mars once had an extensive river system, and possible life. Although Mars looks cold and dry today, conditions could have been very different in its early history. In 2012, the Mars Curiosity rover sent images to earth that showed evidence of ancient water on the planet (and more recent data indicate that water may still flow there). These surface images showed smooth, rounded pebbles that usually result from abrasion as they’re carried along by flowing water. Douglas Jerolmack, a geophysicist at the University of Pennsylvania, and Gábor Domokos, a mathematician at Budapest University of Technology and Economics, wanted to extract more information from the images, if possible. Could the pebble characteristics (specifically, their round shapes) be used to reveal something about the water that had transported them? The answer appears to be “yes.” In a new report published in Nature Communications, Jerolmack, Domokos and colleagues describe an original method to quantitatively estimate the transport distance of river pebbles based only on their shapes. Measures of water flow on Mars would be valuable information to planetary geophysicists. Pebbles lose mass in riverbeds as they get knocked against other pebbles, and current geophysical theory links a pebble’s transport history to the mass it loses from such collisions. How do you determine a transport history, however, if your pebbles are on Mars and you can’t measure mass? Fortunately, pebbles also change shape, becoming smoother and more rounded as they travel. Project work began with Domokos and was inspired by the Gömböc, a three-dimensional object with just two static balance points. A Gömböc shape rights itself on a horizontal surface like a Weeble toy. Unlike the egg-shaped toy, however, a Gömböc has no added bottom weight; the self-righting property is the result of the shape alone. The water abrasion process tends to reduce the number of static balance points on an object, evolving it toward a Gömböc shape. Therefore, information about the natural history of a pebble could be reflected in its shape changes during the transport process. Domokos was also aware of a recent mathematical proof for the Poincaré conjecture (which described topological identities between a variety of three-dimensional shapes and spheres) and adapted it to describe changes to structures like rocks. The Domokos model showed that when two particles of similar size collide with each other, their mutual influence can be reduced to a purely geometric problem. Shape changes could be determined mathematically, regardless of the rock material or the environment in which they are moving. The research team first tested their new model by rolling limestone fragments in a drum and periodically pausing to record the changes to the shape and mass of each piece. The researchers then traveled to a mountain river in Puerto Rico and measured the shapes and weight of rocks every few hundred meters as they traveled down the river from their points of origin. 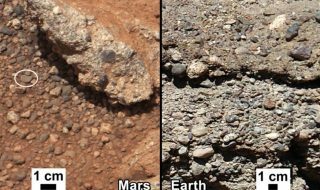 Their final test took place in the sediment deposits of an alluvial fan at the mouth of a New Mexico canyon, an environment chosen because it matched the location of the pebbles imaged on Mars. Their data closely agreed with prediction of their model in all cases. The team could estimate the distance a pebble traveled from its source using only its shape. The next challenge was extraterrestrial. 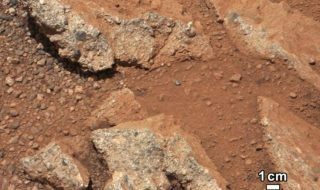 Tímea Szabó, lead author of the paper (who worked with Domokos as a graduate student and later as a postdoctoral researcher in Jerolmack’s lab), analyzed publicly available images of rounded pebbles from the Mars Curiosity mission. Szabó traced their contours and applied the team’s geometric model to show that that the pebbles had lost approximately 20 percent of their volume. The researchers then used their earlier lab and field data to help convert the calculated change in mass into distance traveled. The team based their work on the kind of basalt material found on Mars and corrected for reduced Martian gravity. The results showed that the pebbles had traveled an estimated 50 kilometers (30 miles) from their source. John Grotzinger, of the California Institute of Technology and, until recently, lead scientist for NASA’s Curiosity mission, collaborated with the research team. His earlier NASA estimate for the pebble movement had been 30 kilometers (19 miles), beginning at a crater rim, which meshed nicely with the new calculations. Although Jerolmack is pleased with the performance of their model, he’s also excited about what the advance represents to a range of current science problems. “Now we have a new tool we can use to help reconstruct ancient environments on Earth, Mars and other planetary bodies where rivers are found such as Titan,” he said. The work also shows how a seemingly esoteric piece of mathematics can find real world application.